The cheesecake that we all know and love was developed in 1872 by William Lawrence of Chester, New York. James Kraft developed a form of pasteurized cream cheese in 1912 upon which he acquired the Philadelphia trademark in 1928, thereby creating the celebrated Philadelphia cream cheese. In the U.S., there are many different styles of cheesecake. Chicago Style cheesecake is firm on the outside with a creamy center. New York-style cheesecake contains sour cream or heavy cream (or both). It is rich and has a dense, smooth and creamy consistency. 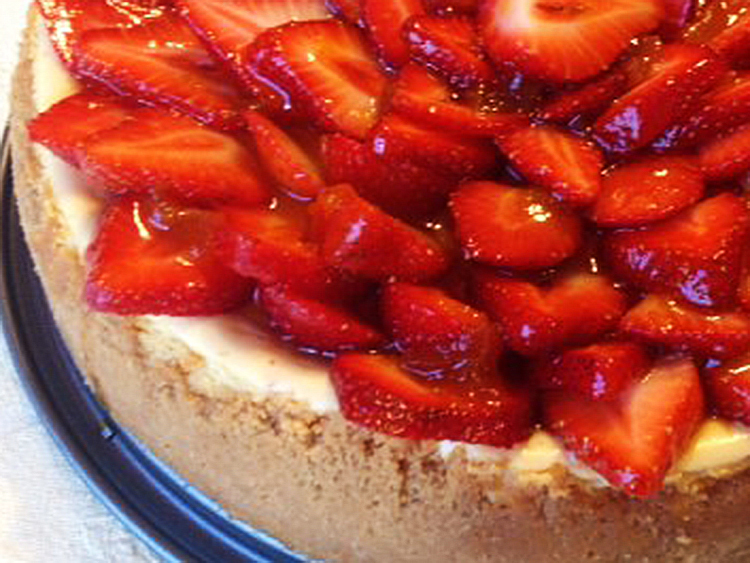 Pennsylvania Dutch-style cheesecake uses farmer’s cheese. Philadelphia-style cheesecake has a lighter texture and sometimes a richer flavor than New York cheesecake. 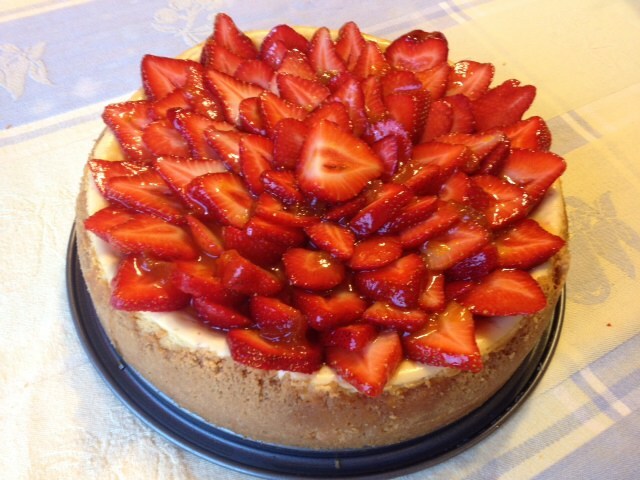 I developed the recipe below in honor of the 40th birthday of a dear and long time friend of mine who specifically requested a fruity cheesecake on the sweeter side. This recipe is a New York style cheesecake with a slightly dense and very creamy texture, full of the flavor of white chocolate. Not for the faint of heart, this recipes has all the fat, calories and carbohydrates one should demand in a truly decadent dessert. It should be served with a generous dollop of freshly whipped crème Chantilly. Place rack in the center of oven and preheat to 325°F. Butter a 10″ springform pan and wrap it with foil. Grind cookies in food processor until fine and add melted butter. Process until moist. Press cookie crumbs into the bottom and up the sides of the prepared pan and bake until set (approximately 15 minutes). Cool pan on a rack and maintain oven temperature. Melt white chocolate and 1/2 c. cream in the top of a double boiler until smooth and creamy. Remove from top of boiler and cool to tepid, stirring occasionally. Beat cream cheese in a large bowl until it is light and fluffy (about three minutes). Gradually add sugar, then salt and beat until smooth. Add eggs one at a time, beating well after each addition. Then add sour cream, whipping cream and vanilla and beat until well blended. Add melted chocolate mixture and beat thoroughly. Pour filling into prepared crust. Bake until the top begins to brown but the center still jiggles slightly when the pan is shaken gently. Approximately 75 minutes. Leave oven door ajar and turn off the oven. Leave cake in the oven for 30 more minutes before removing to a rack to cool. Cake must be chilled at least six hours, preferably overnight. Release cake from springform pan and arrange strawberry slices like rose petals in circles to cover the top of cake completely. Melt preserves and brandy in a small saucepan until boiling and brush the glaze abundantly over the strawberries, allowing the glaze to trickle down between them and onto the cake top. Chill again until serving.